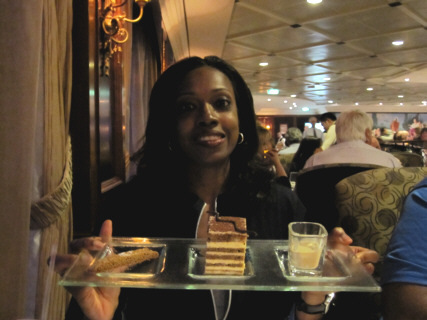 We were extremely pleased with the Azamara Journey. It is a smaller class ship. We cruised with less than 600 of its 694-passenger capacity. Most of the passengers were seniors and from the US. 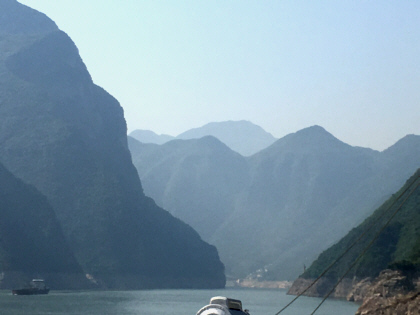 Waking Up in a New City Each Morning: Each of the ports we visited was beautiful and full of things to see. 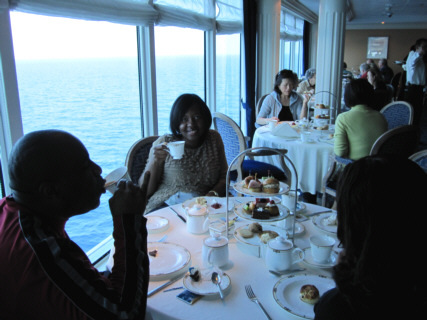 Azamara Staff: Since the Azamara Journey is a smaller class cruise ship, we interacted with the staff frequently. They were professional but yet very personable. Pompeii: I remember the volcano lesson in elementary science class in which we learned about Mt. Vesuvius that destroyed the the city of Pompeii in 79 A.D. but preserved it layers of ash. I never thought I would be walking the streets of this excavated city. Mt. Etna: I know it sounds crazy but we took a tour that allowed us to walk along the crater rims of Europe's most active volcano. Dubrovnik: This walled Croatian city is among the most beautiful I have ever seen. Gondola Ride in Venice: Yes, it's touristy but it was worth the hype for my "I can't believe I am here" moment. Doges' Palace: I was majorly impressed by the large paintings on the ceiling. I also found the ancient prison to be interesting. We used Azamara’s ChoiceAir program to book our flights since the prices were cheaper than those posted on the actual websites of the airlines associated with ChoiceAir. Using this program meant our flight and cruise reservations were linked. Azamara would work with us to make sure we make it to the ship if we ran into problems such as delayed or cancelled flights. Who would have thought a volcano in Iceland and storms in the U.S. would put our trip in jeopardy? Fortunately, London Heathrow Airport reopened the day before our flight, thus allowing Traci and me to make our connection en route from Philadelphia to Barcelona. Sugar and Audie, on the other hand, missed their Delta Airlines connection in Atlanta due to flight delays caused by violent thunderstorms and deadly tornadoes. Fortunately, a nice agent was able to book them on the last Air France flight that evening. They made it to the ship with only 30 minutes to spare but their luggage did not show up until 3 days later. Sugar and Audie made it to the ship but their luggage didn't. Check-in at the cruise terminal in Barcelona was quick and easy. However, we were required to give up our passports and were told we could get them back later in the week. Apparently, Greek security needs to see every passport on the ship before granting clearance. Azamara was collecting passports so that they would not have to awaken passengers on the morning of our arrival in Greece. We were happy to find out that Azamara is included under the enterprise responsible for Royal Caribbean and Celebrity cruise lines. This meant we would get credit for this cruise in the Royal Caribbean Crown & Anchor Society customer loyalty program. Furthermore, already having platinum status in that program meant we qualified for rewards in Le Club Voyage (Azamara's loyalty program). We each got extras such as 150 minutes of free internet usage and a free laundry service for one load of laundry. We received our room key cards which also served as an onboard credit card needed to make purchases on the ship such as gift shop items, pictures, shore excursions, etc. The charges are billed at the end of the cruise to the credit card you provided at check-in. A gratuity of $12.25 per day was also added to our bill. All ship charges are in U.S. dollars. Traci and I had a Club Veranda stateroom. Sugar and Audie had a Club Deluxe Veranda stateroom which has a wider balcony. 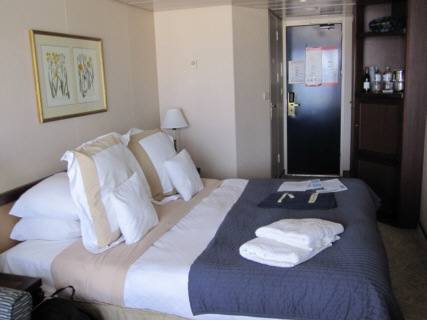 Other than the large floor-to-ceiling mirror at the foot of the bed, the staterooms were not much different than staterooms on other ships on which we've cruised. We were delighted to find out Azamara does not charge for drinking the non-alcoholic drinks in the refrigerator. Our stateroom attendant kept it stocked with water, sodas, and sparkling water. In addition to creating animals out of our towels each evening, he would leave delicious brownies in our room. There were only two minor annoyances with this room. The bed was not high enough for me to slide my suitcase under it. Instead, I had to squeeze it between the nightstand and the wall since the closet could really only accommodate one suitcase. Second, although the bathroom was a typical cruise ship cabin tiny bathroom, I didn't like the shower curtain that always seemed to float in and attack me when taking a shower. I prefer shower doors. 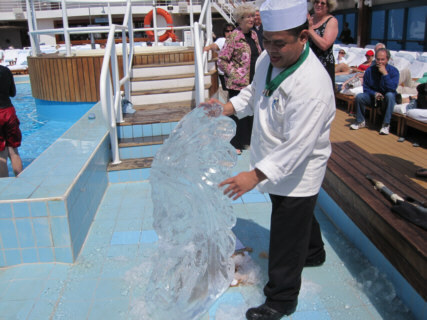 Azamara is serious about health and safety. There are hand sanitizers all over the vessel. I was happy to find out the lifeboat drill no longer requires passengers to wear those lifejackets stored in the staterooms. I never thought they were sanitary given the number of people that wore them for the drills in the past. The captain made an announcement indicating the crew had been instructed not to shake hands during the cruise. This was to minimize the threat of spreading illnesses that can easily spread on cruise ships where people are in close quarters. However, the Azamara staff is so friendly that we received many handshakes and even a few hugs during the week. Fortunately, there were no reports of illnesses. 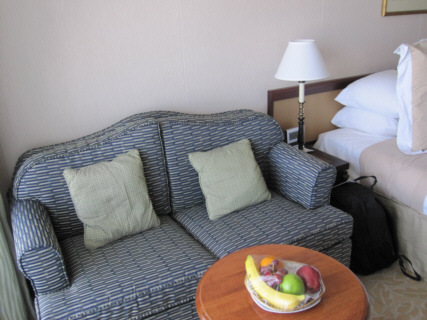 Azamara seems to focus on providing a casual, relaxing atmosphere. There are no loud parties or pool deck contests. There are no formal nights. You can dine in the dining room anytime you want between 6 and 9:30 PM. Despite the casualness, the experience is still elegant and classy. 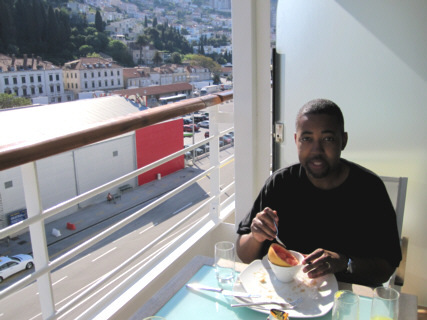 The food on Azamara is the best I've ever eaten on a cruise ship. We normally ate dinner in the dining room where the daily specialties were representative of international cuisines. An alternative to the dining room is the buffet in the Windows Cafe. We only ate breakfast there so I cannot comment on the other meals offered. There are also specialty restaurants that charge a cover of $15/person but we could not justify paying for food when it was already included. About midweek, we discovered what would become our favorite lunch spot - the grill on the pool deck. They served burgers, hot dogs, ribs, kebabs, fries, and more. There are no midnight buffets aboard the Journey. Finger sandwiches and cookies are available in the Cova Cafe lounge if you need a late night snack. The crew will try to accommodate you if you want something other than what's offered. One night, Audie asked for potato chips. Not only did they bring him a large bowl of chips but they made sure he had them in his room every day. Sugar is ready to enjoy dessert. There is a "resort casual" dress code (no jeans, shorts, tank tops, or swimwear) for dinner in the dining room but I did not see this enforced. Oddly enough, this dress code was enforced for afternoon tea. 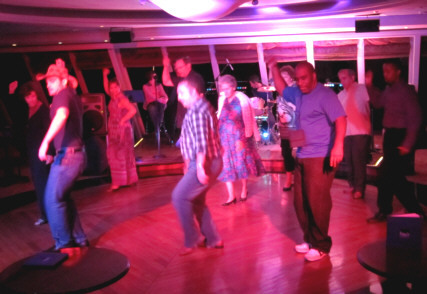 We took part in this activity during our only "at sea" day (day with no port of call). 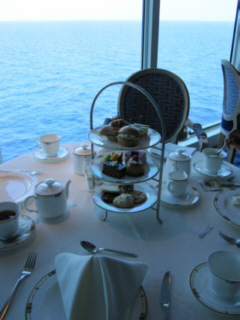 Tea was served along with an assortment of scones, pastries, jams, and finger sandwiches. The waiters were dressed in tuxedoes and a harpist was strumming. Although Sugar and Traci have done afternoon teas before, this was something Audie and I were not accustomed to. This became rather obvious when Sugar and Traci returned from the restroom to find me dunking my tea bag in my cup. Meanwhile, Audie had his tea bag wrapped around his spoon and was wringing it into his cup. After a good laugh, Sugar and Traci schooled us in how to properly take tea. We all had a good time. 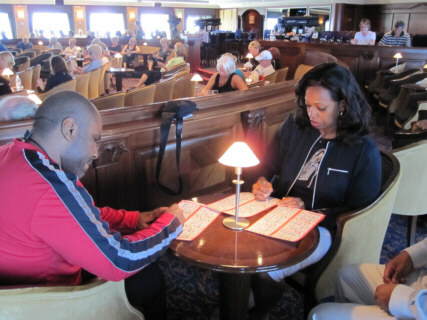 There were many activities onboard to keep passengers occupied. There was a casino. On a whim, I put a few dollars in a slot machine as I was passing by. Within a few spins I hit for $450! I decided not to push my luck and cashed out. Sugar also hit for $350 on slots during the cruise. We each had our preferred activities. The daily ship publication, Pursuits, provided a schedule of available activities. Sugar liked bingo. Traci liked working out and taking the daily Sodoku challenge. Audie enjoyed reading in the library. I, along with Audie, enjoyed the 5:00 PM trivia games. We had a formidable team for the trivia games that included a retired geography professor. "Hmm. What else is happening today?" The pool deck was a nice place to relax. It was April and I did not think the weather at sea (mid-60's) was quite warm enough for lounging in a bathing suit, although there were many passengers who did. We spent our time looking at the calm sea. We would occasionally see porpoises leaping out of the water. Sugar and I actually saw spouting whales as we were chatting on the deck one day. The evening shows on the ship were hit-or-miss. They had the challenge of trying to appeal to a wide range of interests. These were not the grand Vegas-style shows you see on the mega-ships. These were much smaller scale shows held in the Cabaret Lounge. The shows normally consisted of a solo performer accompanied by the house band. The music ranged from Celtic to Motown. We really enjoyed the Motown show given by the very talented Cheryl Sinclair from the U.K.. We became friends with her and would hang out together in the evenings on the ship. Cheryl Sinclair - talented singer! My other favorite performer was Brooks Aehron. 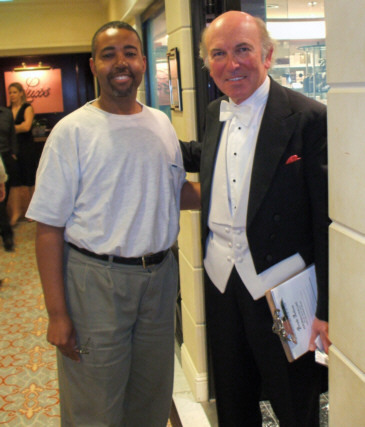 This accomplished pianist performed two nights during our cruise. Sugar, Audie, and Traci are not as fond of classical music as I am so I attended these performances on my own. Brooks' first show ranged from classical music to ragtime but always with a twist. He used gimmicks such as a typewriter, a tennis ball, and chain to show off his ability to be a one man band. However, his second performance was all classical. He performed classics such as Bach's Jesu, Joy Of Man's Desiring, Litz's Hungarian Rhapsody (you know, the one from the Bugs Bunny episode), and Chopin's Polonaise. Before each piece Brooks would provide ten minutes or so of interesting commentary that included information about the composer, rivalries between conductors, or scandals. Then he would launch into playing the piece with amazing dexterity. There was a camera focused on the keys so that you could watch Brooks' hands in action on a screen as he played. I enjoy playing classical piano at home for relaxation. This was a treat for me to watch a professional play some of the pieces I aspire to learn. Brooks Aehron - outstanding pianist! After the evening shows, we would normally grab a table in the Cova Cafe lounge and listen to Dan Daly play piano and sing. Dan is an incredible stride pianist. Other passengers would pull up a chair to chat with us. After Dan's set, he would join us. Our friend Cheryl would join us as well. We would sometimes sit up talking until 2 AM. With a ship this small and Audie's outgoing personality, it did not take long to make friends with the crew and other passengers. Besides, everyone already knew Audie and Sugar were the couple whose luggage was lost. Many people offered them clothing. 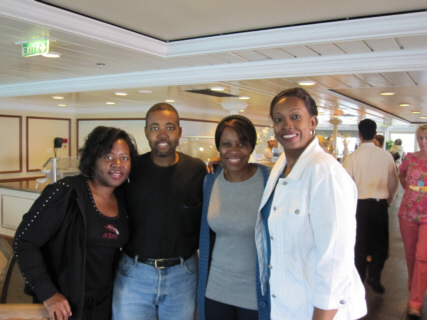 I can truly say we enjoyed our time on the Azamara Journey. There is an ATM machine on the ship that dispensed euros and U.S. dollars. Alternately, you can exchange money at the Guest Services desk. I cannot say enough good things about Guest Services. When I was trying to get transportation information for our post-cruise hotel in Venice, Guest Services called the hotel for me; thus saving me the $7.95/minute charge I would have incurred if I had called from my stateroom. They were a big help for Sugar and Audie whose luggage was lost during the rescheduling of flights. Guest Services made the necessary calls to track down their luggage and have it flown and delivered to them when our ship reached Sicily. 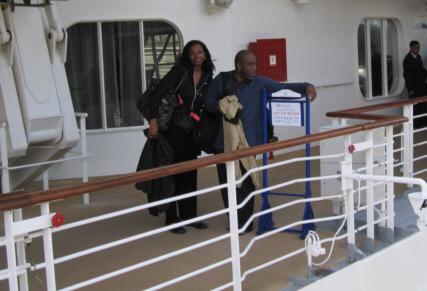 Sugar and Audie chose this cruise because of its many ports of call. With the exception of Monday, each day we visited a different city. We would normally arrive in the morning and depart in late afternoon. 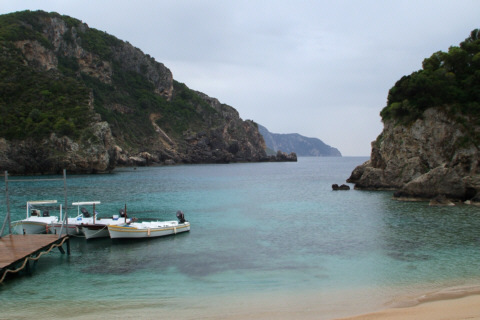 In order to get the most out of our short visits, we decided to do a shore excursion at every port. 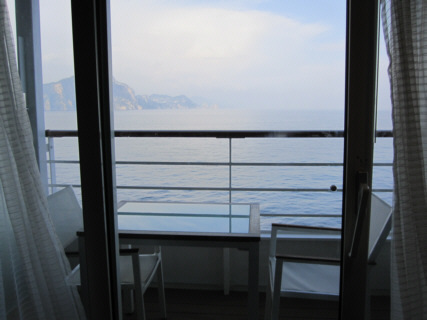 Although we could have booked them via the Azamara website before we boarded, we waited to book on the ship. We could do this via the Shore Excursion desk or through the interactive TV in our cabins. The total cost of our picks was approximately $500 per person. Yes, this is pricey but who knows when we'll make it back to this part of the world again. Audie, who does not care for tours, agreed to do them if Traci and I joined him and Sugar on this cruise. He was a real trooper. With the exception of the day his and Sugar's luggage was to arrive on the ship, he participated in every shore excursion. 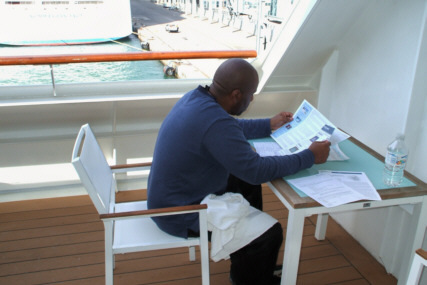 The Azamara staff is very organized when it comes to getting passengers out to their tours. We would normally meet in the Cabaret Lounge at the time specified on our tickets. There were drinks and pastries available as we waited. 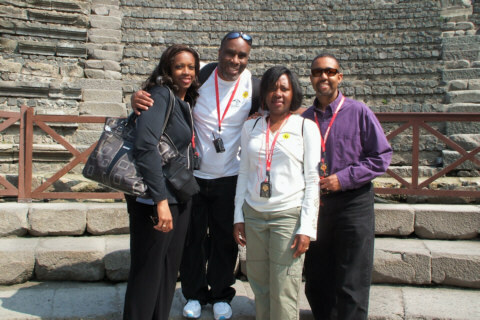 The staff would provide group number stickers based on your excursion and then lead each group out to board the appropriate motor coach and meet our local guide for the day. I like this method much more than other cruises I've done where everyone gets off the ship and then tries to figure out which of the dozens of motor coaches they are supposed to board for their tour.